What are these artworks about? 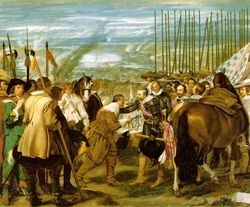 Lesson Description: This lesson will provide students an opportunity to understand how an artwork can appear to be just documentary yet, at the same time, be making a comment about an event or issue. Through small and large group discussion structures, students will discover how selected artworks may have more than one purpose. Students will compare and contrast art works to construct understanding of the artist's purpose for the work. Can an artwork be both documentaries to commentary? What techniques to artists employ to communicate the intent of their artwork? Understand how art about war and conflict has changed from being documentary to becoming commentary. Understand why artists choose to create a documentary or commentary artwork. Understand what social and technological changes have influenced the change in the purpose of art from documentary to commentary. Find similarities between music in the visual arts when it comes to documenting and commenting on history and social issues. Write and present a critique of a chosen artwork in relation to its historical and commentary messages. 1. The teacher will ask the students what do Pablo Picasso and Alan Jackson have in common? Then proceed to show them a short music video of Jackson's song Do You Remember, which features images from the attack on 911 then transitions to the attack on Guernica in 1937. 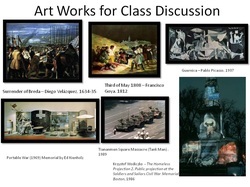 ** The teacher will present 6 artworks from different time periods with a common theme of war or conflict for class discussion. The teacher will document student responses on the board. What is happening in these artworks? What do these artworks have in common? How are these artworks alike and different? Which artworks are documenting an event? Which are commenting about an event? Does the media used effect the impact of the artworks? What if a different media were used with the same composition would it be more or less effective? 2. Students will break into small groups; each assigned a different artwork from the presentation. Utilizing prior knowledge of the art criticism process, each group will discuss and write down a brief summary of what they think the artwork is about and what evidence from the artwork leads them to their conclusion. 3. Students will also receive a packet of information about the artist, artwork, historical and sociological information surrounding the artwork. 4. Student groups will read and discuss the information and how it relates to their interpretation of the artwork. 5. Each group will work as a team to write a new critique of the artwork based on their understanding of the artwork in context to the new background information. ** Students will back up their understanding of the artwork's purpose and message with information discovered through their research and discussions. ** Students must be able to answer the questions they created through their presentation. Letter Grade of A: Critique described the artwork in detail noting the main subject and use of color. The composition was analyzed noting the main compositional elements and how they relate to each other. The critique referenced the time period it was made in and how the artist referenced or documented that time. 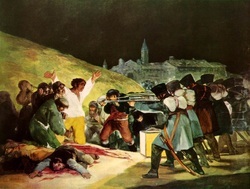 The artwork was interpreted for meaning and that interpretation was supported by visual facts form the artwork and related history of the time period. Critique explained what makes the artwork a simple documentation or a more complex commentary and supported their statements with facts form the artwork or from the research about the artist or time period. Letter Grade of B: Critique described the artwork noting the main subject. The composition was analyzed noting the main compositional element. The critique referenced the time period it was made in and how the artist referenced or documented that time. The artwork was interpreted for meaning and that interpretation was supported by visual facts form the artwork and related history of the time period. Critique explained what makes the artwork a simple documentation or a more complex commentary. Letter Grade of C: Critique gave a basic description of what is seen in the artwork. The composition was analyzed noting the main subject and how the artist created emphasis. Reference was made to the available research in determining the artwork’s meaning or message. Critique explained what made the work a documentary or commentary art piece. ** No D or F ** Critiques that do not meet at least the “C” mark will have to be rewritten. Letter Grade of A: Group did not read directly from their critique but did explain the how the artwork was composed, what the significant elements in the work are, what was happening in the time the art was created, what (if any) symbolism was included in the work, and what and how the artwork documents or makes a comment about. Group answered the questions they proposed about their artwork for use in the end test. Letter Grade of B: Group read directly from their critique. Group made some connections between imagery in the artwork and the time period it was created in. Group described what made the work a successful documentary or commentary artwork. Group answered the questions they proposed about their artwork for use in the end test. Letter Grade of C: Group pointed out some of the significant features of the artwork. Group made some connections between imagery in the artwork and the time period it was created in. Group described what made the work a successful documentary or commentary artwork. Group addressed some of questions they proposed about their artwork for use in the end test. 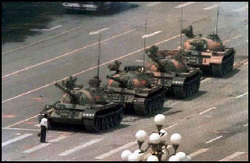 Images for class discussions about how artists have documented and commented on conflict at the same time. Each of the artworks below are links to their original sites. 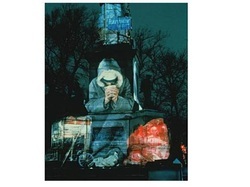 You can find useful information about the artworks on their home sites. Applicable Virginia Standards of Learning.